The Menagerie joins The Fringe Bar’s week of Matariki Celebrations this year. The Fringe Bar – in its new home on Allen Street – will celebrate a full week of Matariki celebrations and The Menagerie, Wellington’s monthly variety show, has brought together a glittering collection of stars to dazzle the stage. Producer Rachel Rouge says they have been working in partnership with Jo Paku to be part of Te Wiki o Matariki (Matariki week) “We are very much enjoying this collaboration with Jo, she’s amazing and has been able to get us in touch with some stellar performers creating a fantastic line up.” says Rouge. 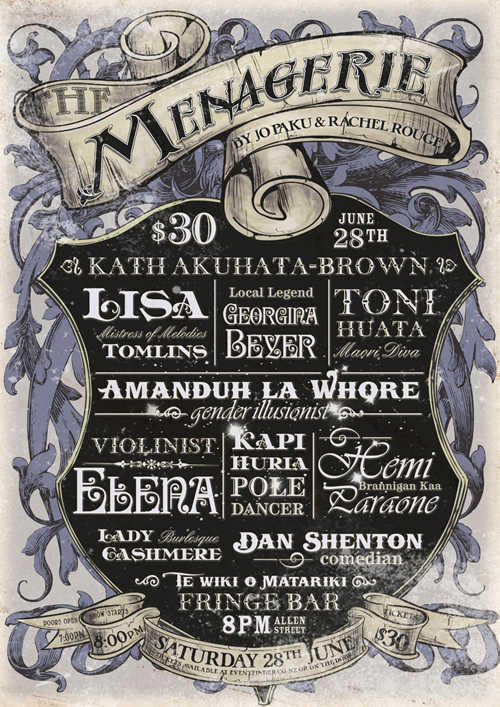 The Menagerie on Saturday the 28th of June will feature performances by singer Lisa Tomlins, violinist Elena, Māori diva Toni Huata, Hemi Paraone (Brannigan Kaa singing James Brown classics) former MP Georgina Beyer, burlesque dancer Lady Cashmere and gender illusionist Amanduh la Whore as well as storytelling, pole performance stand up comedy and more. Matariki is the Māori New Year and occurs during the rise of the Pleiades star constellation (also called Matariki and the Seven Sisters). It is the time to reflect on the year past and plan for the year ahead. Jo Paku, is organising a full week of events at The Fringe bar and has been brought on as co-producer for the June Menagerie show “I thrive on promoting Māori talent, te reo and waiata by creating events that can be enjoyed by all” says Ms Paku. The Menagerie is a fun, frivolous and light hearted monthly variety show that celebrates high quality and unusual live performance, it’s on at 8pm on the last Saturday of every month (except December). The last show sold out, and people were being turned away at the door, we recommend buying tickets early to avoid disappointment.